The Harlem Quartet, a Sphinx Ensemble, is proud to announce its newest member, cellist Paul Wiancko. Chosen after an intensive search, Wiancko succeeds founding member and cellist Desmond Neysmith, who has left the quartet for family reasons. 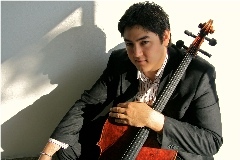 Wiancko has already appeared with the quartet-which also includes Ilmar Gavilán and Melissa White, violins, and Juan Miguel Hernandez, viola-in performances at the Great Lakes Chamber Music Festival in Bloomfield Hills, Michigan in June 2010, as well as recent concerts on Chincoteague Island, Virginia and in Columbia, Maryland. Diversity has always been of utmost importance to the Harlem Quartet. The ensemble balances all of its programs between classical masterpieces and contemporary music, works by minority composers, and jazzy repertoire-much of which calls for improvisational skills. Now, with the appointment of Wiancko-who is of Polish and Japanese extraction-the quartet is further embracing diversity in its membership. "We believe this is a reflection of the universal nature of music, as well as the extraordinary diversity of our society," said Ilmar Gavilán, the Harlem Quartet's first violinist and spokesperson. "Paul's addition will be tremendously beneficial in helping us build new audiences around the world. We're particularly excited to welcome Paul because he possesses a creative spark and vivacity as a performer. He has both the imagination and technical versatility needed to explore new musical territory with us. At the same time, we all want to express deep gratitude to our founding cellist Desmond Neysmith, whose superb musicianship and skill as a communicator with audiences of all ages has played a big part in the quartet's success." As a soloist, Paul Wiancko has been featured on stages in South America, Asia, Europe, and across the United States, and has won top prizes in the Lutoslawski International, ASTA, Debut, Pasadena Showcase, John Walker, and Los Angeles Spotlight competitions. A devoted chamber musician, Wiancko has been invited to the Olympic, Laguna Beach, and Marlboro music festivals and has performed with such artists as Richard Goode, Lynn Harrrell, Midori, and members of the Guarneri and Juilliard Quartets. Recognized not only as a classical cellist, Wiancko has also garnered respect as a collaborator, composer, and producer. He has recorded and produced a wide array of projects, from indie rock and electronic tracks to his own Hip-Hop Cello Concerto, the New York premiere of which was hailed by Sequenza21 as "surprising, fun, fresh, and innovative." Since its inception in 2006, the Harlem Quartet has been advancing diversity in classical music while engaging young and new audiences through the discovery and presentation of varied repertoire. The group made its acclaimed Carnegie Hall debut in 2006 and has since been lauded by audiences around the United Sates, Europe, and South America. It has appeared before President and Mrs. Obama and their guests at the White House, and was featured on The Today Show on Christmas Day 2009. The quartet was also selected recently as the next ensemble in New England Conservatory's prestigious Professional String Quartet Training Program, directed by cellist Paul Katz. The Harlem quartet, a Sphinx Ensemble, was founded by the Sphinx Organization in 2006. Sphinx is a national non-profit organization focused on building diversity in classical music and providing access to music education in underserved communities. The quartet is managed by Sciolino Artist Management, a boutique artist management firm based in New York City.